Bruce Weiner is selling the contents of his Georgia Microcar Museum in one huge auction. Most, but not all, of these cars are from Europe, built in the years just after the second world war when fuel was scarce and road taxes were high. This Scootacar, a rather late model as microcars go, is from England. 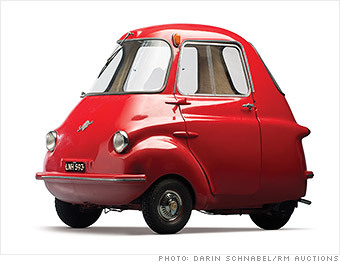 Like many microcars, it's essentially a three-wheeled scooter with an enclosed body. It's even steered using something that looks very much like handlebars. Only 1,500 were made and very few survive.